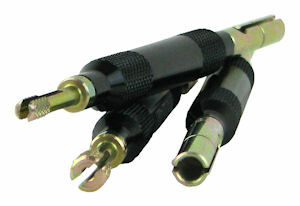 IPA introduces the Plow Terminal Cleaners (#8045), a first-time tool designed to clean plow electrical connectors.This patented, three-piece set is made for removing corrosion from common round pin (male and female) plow connectors found on electro-hydraulic grill mounted plow connectors on Meyers, Boss, Fisher, Western and similar type plows. Over time, electrical connections become corroded and dirty, often causing circuit failure. If left uncleaned, connection pins will need to be cut and repaired, or the electrical harness will require replacement. The Plow Terminal Cleaners saves time and money by quickly reconditioning electrical connections. The set is housed in a leather type holster with magnetic clasp.